These cupcakes are surprisingly simple to make for a party! 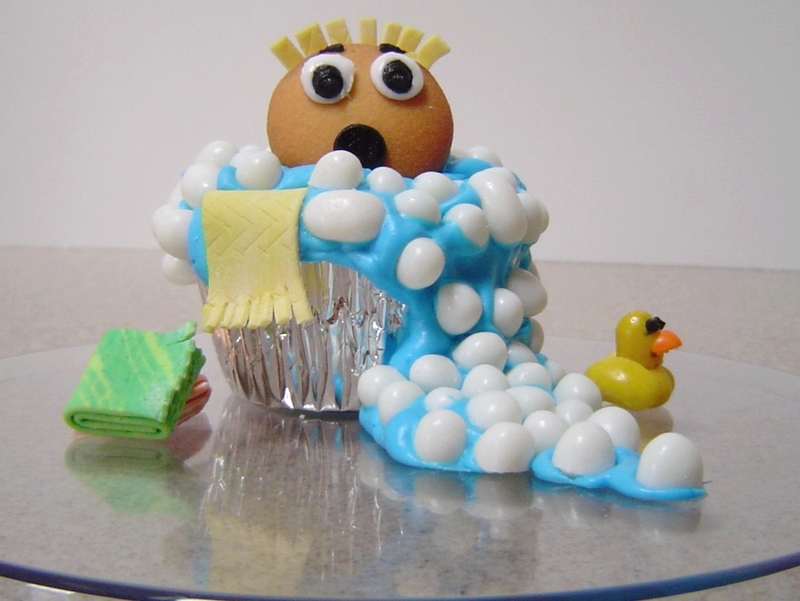 Just follow the directions from Lisa Schrader, Jelly Belly Cupcake Challenge winner, to create her "Bubble Trouble" cupcake design inspired by her son's tendency to overflow the tub. Recipe makes 1 Bubble Trouble Cupcake. Reserve small amount of vanilla icing for eyes. Tint remainder blue with food coloring. Frost cupcake with blue frosting, piping and spreading small amount down side of cupcake as overflowing "bath" and onto serving dish. Halve most Coconut Jelly Belly beans. Leave some whole. These are your "bubbles." Place bubbles onto cupcake and down side to your liking. Using kitchen shears, snip short ends of three sticks of gum to look like fringe on a bath towel. Cut one in half and push into frosting at side of cupcake to look like it's hanging from bathtub. Fold other two pieces, first in half, then in half once more, and place beside the tub. Snip long side of yellow stick of gum and use frosting to attach to back of vanilla wafer for hair. Pipe two white circles onto wafer for eyes. Then, using black frosting, add pupils for eyes and wide open mouth. Place onto cupcake secure back with frosting to prop up. To make rubber duck, cut one Sunkist® Lemon Jelly Belly bean in half and use one half for head. Cut another Sunkist® Lemon bean in half lengthwise for wings. Snip a small piece of Orange Sherbet Jelly Belly bean for beak. Assemble by gently pushing all pieces together in place on body of duck. Cut pieces will stick to each other. Using black frosting, add two small dots for eyes above beak. Place next to cupcake.